The Quad Squadders helped family members commemorate those lost in a historic plane crash. The Eureka Springs Backroads Route from Harrison, Arkansas, is a memorable route you will want to take. Clubs provide an opportunity for ATVers to keep riding areas open, meet new people and change the public perception of the sport. Polaris is cranking out extreme performance for 2012 with a new high-output 850 twin EFI engine and upgraded throttle bodies in the Sportsman XP 850 H.O. EPS. Greater power to the ground means 20 per cent quicker acceleration and the SOHC engine delivers a clean fuel burn for smooth power delivery. Pair these up with 12 inches of ground clearance and there won’t be a rock, rut, or log that can keep you down. 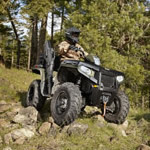 Variable Assist electronic power steering means better handing on obstacles and at low speeds and the ergonomically engineered vehicle body with 33 per cent wider floorboards and a narrow width at the knees and ankles means toughness on the trail—not on your body. Long dual A-arm front suspension and having the steering axis near the neutral center of the tire radically reduces kickback so you can save your energy for adventure. Stay connected with fellow sledders, ATVers or motorbike riders with the Scala Rider G4 PowerSet communications system. This handy gadget allows riders—either riding together or on separate machines—to stay in touch within a range of up to 1.6 kilometres.